There are several ways you can reduce the amount of money you spend on your home insurance in FL annually. The easiest way is simply to shop with us. We offer fast and friendly service. Upon your request, we could send you a full list of available FL home insurance (carriers and pricing) and then you could ask friends and family who they use or recommend out of this list. After you determine which company you like best, call us back at 352-200-2066 and we'll complete the application for you. Another great way to lower your home insurance in FL is to raise your deductible. A deductible is the out of pocket cost you pay when you file a claim, and they have to be covered before your insurance company will release any funds for repair or replacement. It is important to choose a deductible that you can meet, but it does make a difference how much you are willing to pay. It is as simple as this: the higher your deductible, the lower your monthly payments. A common mistake many homeowners make when choosing home insurance in FL, and their deductible, is to include the value of their land with the value of their house and its contents. Your land cannot be stolen or damaged, and will not be considered in the value of your property should anything happen. Make sure when you decide which policy you want that you cover the contents of your house appropriately, without including the value of your land, or your premium will be too high. We'll figure out the proper amount of coverage. We just need the answers to these questions. Another way to save money is to bundle all your insurance needs with the same provider, not just getting FL home insurance, but also an Florida auto insurance quote. Many companies offer discounts for bundling. Today the environment is a hot button issue and many major companies offer paperless discounts as well. Online bill paying and automatic drafts from your bank account can often earn you a reduced rate as well. Bringing an existing home up to codes or installing energy saving materials can also help to lower the cost of home insurance in FL. Storm windows, doors, and shutters are all things that you can install that will make your home safer, and thus safer to insure. There are also discounts for home security systems and fire alarms. Just adding deadbolts, and window locks can earn you reduced FL home insurance pricing sometimes. Some companies also offer discounts for retired homeowners since they are likely to be home more often and could spot a problem sooner. Look for discounts wherever you can find them, but make sure that you aren’t sacrificing good coverage just to save a buck or two in the short term. Another important thing to do is keep an eye on your credit score. Maintaining your credit is important anyway, but many insurers will base your rates on your score and it literally pays to keep it clean. 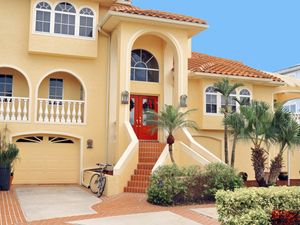 These are just a few ways that you can reduce the cost of your home insurance in FL.